A single injection of LPS produced low-grade neuroinflammation leading to Parkinson’s disease (PD) in mice several months later. 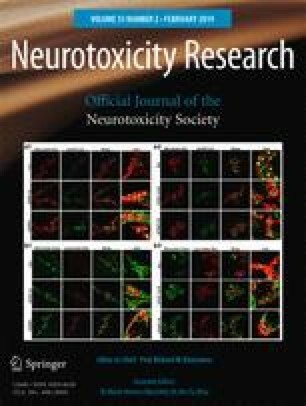 Whether such a phenomenon occurs in rats and whether such low-grade neuroinflammation would aggravate rotenone (ROT) neurotoxicity and disrupts circadian clock gene/protein expressions were examined in this study. Male rats were given two injections of LPS (2.5–7.5 mg/kg), and neuroinflammation and dopamine neuron loss were evident 3 months later. 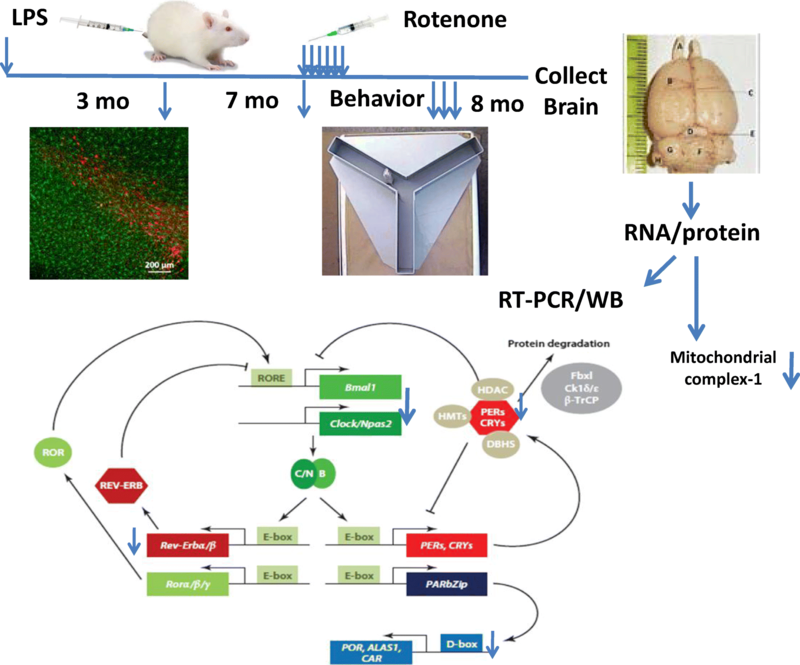 Seven months after a single LPS (5 mg/kg) injection, rats received low doses of ROT (0.5 mg/kg, sc, 5 times/week for 4 weeks) to examine low-grade neuroinflammation on ROT toxicity. LPS plus ROT produced more pronounced non-motor and motor dysfunctions than LPS or ROT alone in behavioral tests, and decreased mitochondrial complex 1 activity, together with aggravated neuroinflammation and neuron loss. The expressions of clock core genes brain and muscle Arnt-like protein-1 (Bmal1), locomotor output cycles kaput (Clock), and neuronal PAS domain protein-2 (Npas2) were decreased in LPS, ROT, and LPS plus ROT groups. The expressions of circadian feedback genes Periods (Per1 and Per2) were also decreased, but Cryptochromes (Cry1 and Cry2) were unaltered. The circadian clock target genes nuclear receptor Rev-Erbα (Nr1d1), and D-box-binding protein (Dbp) expressions were also decreased. Consistent with the transcript levels, circadian clock protein BMAL1, CLOCK, NR1D1, and DBP were also decreased. Thus, LPS-induced chronic low-grade neuroinflammation potentiated ROT neurotoxicity and disrupted circadian clock gene/protein expression, suggesting a role of disrupted circadian in PD development and progression. The original version of this article contained mistakes, and the authors would like to correct them. Some parts of the image in Figure 5 were missing. The online version of this article ( https://doi.org/10.1007/s12640-018-9968-1) contains supplementary material, which is available to authorized users. A correction to this article is available online at https://doi.org/10.1007/s12640-018-9982-3. Huan Li, Jie Liu, Sheng Song, Feng Zhang, and John Hong conceived and designed the experiments. Huan Li, Jie Liu, Sheng Song, Yuan Wang, and Chun Huang participated in the experiments performance and data analysis. Huan Li, Sheng Song, Jie Liu, Feng Zhang, and John Hong wrote and revised the article. All the authors have reviewed the contents of the manuscript and approved the submitted manuscript. This study was supported by the National Natural Science Foundation of China (no. 81460556). This study was supported in part by the intramural research program of National Institute of Environmental Health Sciences, NIH, USA.